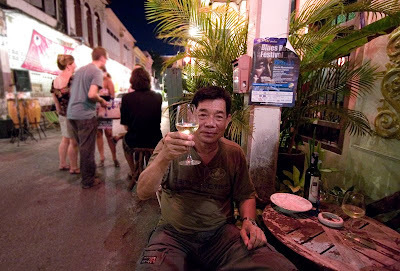 We had met Khun Puchong in January at a restaurant, he is the owner of the Glastnost Bar / Cafe in Phuket Town.. he told us of Jazz / music jam sessions every 4th Sunday of the month. We missed the January session, but on February 28th we (a rare occasion!) left our kids with a friend and headed out on the town. 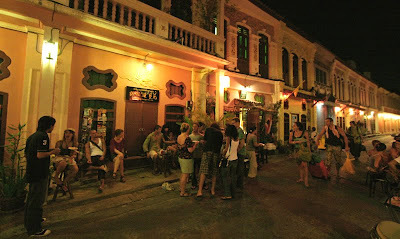 The Glastnost Bar is on Soi Romanee in the old part of Phuket Town, it is a small street connecting Thalang Road with Dibuk road. This part of town has recently been renovated - all wires have been either put underground or have been stuck to the side of the buildings so there are no unsightly overhead wires. We saw this already in December at a street festival on Thalang Road. There were just a few people at the Glastnost. The old town was quiet with bars closed due to the religious holiday. Soi Romanee was pretty empty - we were there not long after 8pm, so a bit early really. Puchong greeted us like old friends and insisted I joined him for some wine to celebrate his birthday which had been a couple of days earlier. No music was playing yet, so I had a look around inside. Glastnost is almost like a museum (with drums and a microphone) - lots of old photos and memorabilia around the room. 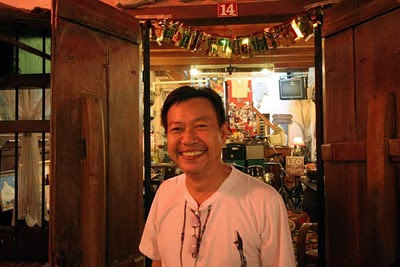 My parents had found this place when they came last time and enjoyed talking with Puchong about jazz - he loves jazz and my parents when they were young boppers were regulars at their local jazz club. 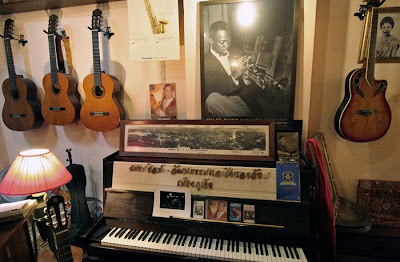 Thus you have photos on the wall of Ella Fitzgerald, Miles Davis and of course HM King Bhumibol and his saxophone. A few people drifted down the street, some backpackers looking for a sign of nightlife, some friends of Puchong, my wife and I sat and chatted with Puchong and his friend Boonlert who owns an electric shop just down the street on Thalang Road. 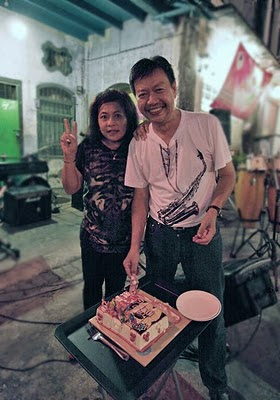 We did not know it was Puchongs birthday so I owe him a bottle of wine next time - he told us there will be a live music evening on the 19th of March with a jazz band from Chiang Mai - see you there! Puchong is actually a lawyer, quite a big one, with lots of connections in Phuket and Bangkok. The Glastnost is his hobby, not a business exactly - in fact, he told us that he couldn't sell us a drink - but we could get one at a nearby guesthouse on Soi Romanee. It was quiet that night, but should be busier on the 19th. More people turned up as the evening progressed and a little live music started. 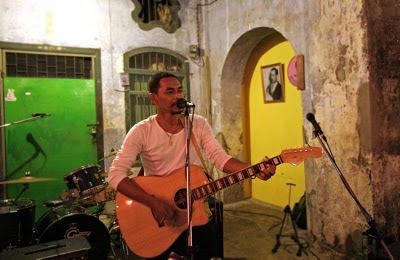 The guitar man (his name is Ali) below is well known to us - we met him first in the Beach Bar - see here - this is also where we'd met Puchong in January. It's one of our favourite spots, and I can see that Soi Romanee might become a favourite hangout too! A view of the street shows that we had a little crowd going by 10pm. Puchong invited any passers-by to join. OK, this was a quiet evening, being a Buddhist holiday - the temple at the end of Soi Romanee, Wat Mongkhon Nimit, was much busier! Anyone walking past was welcome. Plenty of Puchong's friends showed up, and there was a birthday cake too. This is a Thai birthday party - if you happen to be sitting nearby you are given some birthday cake. Anyone who wants to moan about the "Land of Smiles" being just a name.. you better come to the real Thailand. 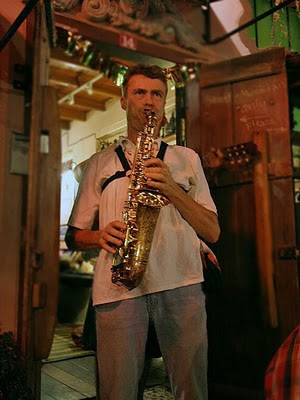 Happy Birthday was played on the saxophone by a German friend of Puchong. Cake was eaten. Life is good. 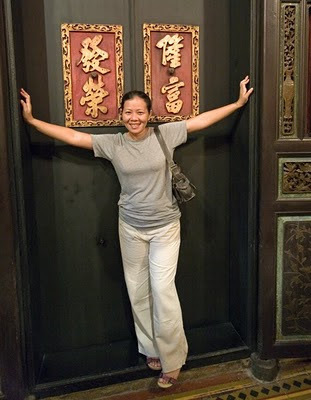 Old Phuket Town for me is a very interesting place with a special character. What we experienced last Sunday.. you cannot find this near the main beaches of Phuket. The old town has an almost magical feel. 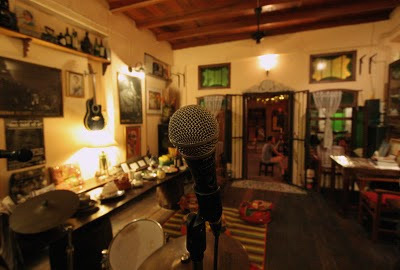 We will be back at Soi Romanee on the 19th for a quiet night of jazz. UPDATE 2016 - The owner of Glastnost is a lawyer and working in Bangkok. He's not been around the last couple of years.